Gen. Ellen Pawlikowski, commander, Air Force Materiel Command, (from left), Ms. Patricia Young, AFMC executive director, Maj. Gen. Warren Berry, AFMC vice commander, and Chief Master Sgt. 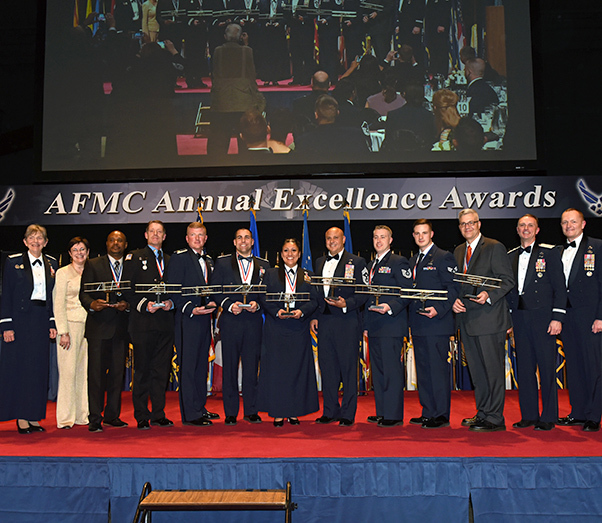 Jason France, AFMC command chief, pose for a group photo with the winners of their perspective categories during the AFMC Annual Excellence Awards Banquet, Mar. 7, 2018, inside the National Museum of the United States Air Force. The Annual Excellence Award Banquet on March 7, 2018, served as the venue to honor Air Force Materiel Command’s top Airmen for 2017. Four airmen from Edwards Air Force Base, Calif., were honored as part of the evenings festivities. Nominees in nine separate categories–airman, non-commissioned officer, senior NCO, first sergeant, company grade officer, field grade officer, civilian category I, civilian category II and civilian category III-competed from throughout AFMC’s headquarters, centers and wings. Gen. Ellen Pawlikowski, AFMC commander, hosted the ceremony for family, friends, community leaders and command officials gathered in the Modern Flight Gallery of the National Museum of the United States Air Force. “Tonight we’re recognizing 61 Airmen who make me proud to wear this uniform. I can’t imagine a better place to be than here to celebrate,” said Pawlikowski. Chief Master Sgt. Jason L. France, AFMC command chief provided further glimpses into the character of the honored AFMC Airmen. Airman Category–Senior Airman Patrick O. Schilling, Air Force Sustainment Center, Hill Air Force Base, Utah. As an Explosive Ordnance Disposal Journeyman, Schilling filled the role of munitions account manager for the Air Force’s largest custodial account during his supervisor’s absence, during which he was responsible for saving $6 million in storage and maintenance costs. From this position, he earned Air Force Materiel Command’s nomination for Enlisted Military Assistant to the Secretary of Defense. Furthermore, he partnered with the United States Secret Service during the presidential inauguration. Non-Commissioned Officer Category–Tech. Sgt. Jonathan E. Patrick, Air Force Life Cycle Management Center, Hanscom Air Force Base, Mass. Patrick distinguished himself as Officer-in-Charge, Internal Medicine Clinic B, 88th Medical Operations Squadron, 88th Medical Group, 88th Air Base Wing, Wright-Patterson Air Force Base, Ohio. Patrick led 45 staff in providing care for 5,700 encounters over nine clinics for the command’s second largest hospital. Additionally, Patrick managed patient services for 1,700 personnel while deployed as a medic in support of Operation Inherent Resolve. 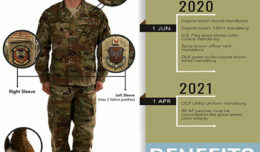 Senior Non-Commissioned Officer Category–Senior Master Sgt. 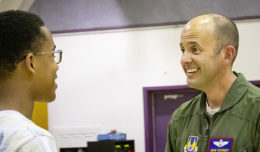 Matthew E. Hose, Air Force Test Center, Edwards Air Force Base, Calif. As Munitions Flight Materiel Section Chief, 96th Maintenance Group, Eglin Air Force Base, Fla., Hose’s leadership was pivotal to his flight supporting the Air Force’s first-ever testing of light aircraft as a close air support force multiplier. He ensured six live bombs were prepared, inspected and shipped to the test range in under six hours versus the one week standard. Also, he developed and implemented a Combat Munitions Crew Chief course that will qualify 18 deployed persons each year. First Sergeant Category–Master Sgt. Vanessa Brown, Air Force Test Center, Edwards Air Force Base, Calif. For an entire year, Brown served distinctively as First Sergeant for the 412th Logistics Test Squadron, 412th Maintenance Group and the 412th Test Wing. As the prime adviser to three separate squadron commanders and directors, she solved 23 quality of life issues and assisted squadron members through personnel trials. Her actions impacted 687 personnel supporting 117 test programs for the wing. While mentoring at the First Sergeant Symposium, she teamed with three, nine organizations and seven other First Sergeants to develop 40 Additional Duty First Sergeants, raising wing capabilities 60 percent. Company Grade Officer Category–Capt. Dayne M. Foote, Air Force Life Cycle Management Center, Hanscom Air Force Base, Mass. As Operations Officer, Foote deployed to Afghanistan where he flawlessly led 274 personnel from six nations, providing 414,000 hours of security to 700 coalition force advisers. His efforts directly led to the success of 26,000 “outside the wire” combat missions, the security of 836 million Afghani Air Force aircraft and recovery of 500 million commandeered equipment. Field Grade Officer Category–Maj. Kelly J. Mattie, Air Force Test Center, Edwards Air Force Base, Calif. As an Explosive Ordnance Disposal commander, Mattie was responsible for leading the Air Force’s busiest Explosive Ordnance Disposal unit through execution of 450 operations accounting for 70 percent of the command’s missions. He was by-name requested to direct the Pacific Command’s Explosive Ordnance Disposal contingency plan development, posturing friendly forces to meet uprising theater threats. Mattie mobilized the first Explosive Ordnance Disposal capabilities within Syria. Civilian Category I–Bruce R. Ehrenberger, Air Force Test Center, Edwards Air Force Base, Calif. Ehrenberger distinguished himself as lead firefighter by overseeing a four-member crew, 13,000 man hours, 480 training hours, a $1.2 million dollar vehicle fleet, and 126 emergency responses. As the first responder at a fire involving the world’s largest climatic lab, he directed extinguishment actions saving the 500 million dollar testing facility. He also completed an Emerging Leaders Course while simultaneously adding nine college credit hours towards his associate degree in the landmark Air University civilian degree program. Civilian Category II–Robert L. Daniels, Air Force Test Center, Eglin Air Force Base, Fla. Daniels distinguished himself as Materiel Management Flight Chief by providing expedited recovery for 475 repairable F-35 assets back into the supply pipeline, reducing the return days from 31 to three days. Additionally, Daniels’ leadership guided the Arnold Engineering & Development Center fiar compliant solution for a 43 million dollar asset stockpile, closing a 60 year accountability gap. Civilian Category III–Donald I. Brown, Air Force Sustainment Center, Fort Belvoir, Va. Brown distinguished himself as Director, Operations Support Directorate, Air Force Petroleum Office, 635th Supply Chain Operations Wing, providing leadership to a staff of 21 fuels professionals. His guidance influenced responsive resolution support to 120 installations for 1,100 technical issues; enabling safe movement of 2.2 billion gallons of fuel to 800,000 aircraft missions. Further, he advocated “Art of the Possible” process improvement directing an Air Force-wide review of refueler validation processes reducing five-day process to only 30 minutes. Winners in the four enlisted categories will represent AFMC in the United States Air Force Twelve Outstanding Airmen of the Year and First Sergeant of the Year competitions held later this year.